Jewel Kats, author, disabilities advocate, and real life Archie Comics character, died this past weekend. I profiled her in This Magazine’s ‘30 Totally Awesome Social Justice All-Stars‘ issue last year. I remember that she would get tired throughout the interview process so we would take breaks, but when she came back it was always with honesty and enthusiasm. 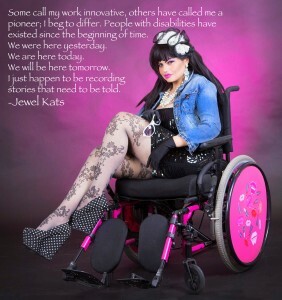 I learned about Kats at the 2014 Beauty Confidence Canada Awards, where she had won an award but, due to health issues, could not attend the reception. I became interested in learning her story and I soon found out she was a real life Archie character! I had to know more. Kats is a woman many of us can relate to in some way. She had been through a lot in her life, “People have found inspiration from my real life story,” she said in our 2014 interview. “I’ve personally triumphed over a childhood car accident, sexual abuse in my teens, anorexia, depression and divorce in my adult years. I’ve never let anything or anyone stop me. I refuse to give up.” This refusal to give up is what drove her. English was her second language. Kats learned how to read by piecing stories together through illustrations in picture books. Seeing her as an adult—in her hot pink wheelchair and fancy headpieces—it wasn’t surprising to learn Dr. Seuss appealed to Kats. By the age of nine Kats was getting lost in books. It was on the way to a Scarborough bookstore that someone drove into her mother’s car. It was a bad accident. Kats was sent to SickKids Hospital, where she stayed for six weeks before being sent home in a body cast. She continued to be on and off bed rest for the rest of her life. Rest may not be the appropriate word, though. Back to the Archie comic that first made me want to know more: As a kid, Kats liked to read Archie comics. Yet, while the stories were great, she had no character to truly relate to. As she got older, she developed a comic strip series called The DitzAbled Princess. This series brought her to the 2013 Toronto Fan Expo, where she met Dan Parent, her favourite writer and artist of the Archie series. Looking him in the eye, she asked how it was possible for Riverdale to have no characters with disabilities. And so came Harper Lodge, a columnist who uses the pen name Jewel. It seems only natural for such a vibrant woman, in spirit and style, to become a comic book character. Kats continued to ensure characters with disabilities were represented in her own children’s books, like the popular Cinderella’s Magical Wheelchair and Hansel and Gretel: A Fairy Tale with a Down Syndrome Twist. In her book Reena’s Bollywood Dream, Kats writes about sexual abuse. Kats didn’t stop there. Just like she wanted a character to relate to in storybooks, she wanted a fashion-themed word search book to do for those days in bed. So, she went ahead and made one. When Kats found out I was writing for Anokhi she told me how much she wanted to be involved with them. I sent her the editor’s way and immediately after she was at their 12th Anniversary awards show, collecting another award—as Crusader of the Year for People with Disabilities—for her ever-growing collection. A week ago, on her site, Kats posted a picture of this past summer’s PanAm Games, where she carried the Pan American Sports Organization (PASO) flag during the opening ceremonies. She was very excited about that. I’m heartbroken over the passing of Kats. After our initial interview we kept in touch and to hear encouraging words from someone so driven is invaluable. Judging by social media, many others feel the same way.